After your cruise ship docks at the Port of Rhodes, enjoy a full-day shore excursion to the village of Lindos and Rhodes Old Town, led by a private guide. Explore Lindos Acropolis and the enchanting village on a walking tour, and then spend the afternoon visiting the Acropolis of Rhodes and Rhodes Old Town. Hear little-known facts about Rhodes historical landmarks and admire must-see sights such as the Palace of the Grand Master of the Knights of Rhodes. All entrance fees are at your own expense. Start your shore excursion with a pickup from the Port of Rhodes, and then travel along the islands east coast with your private guide. Gaze out of your minivans window at some of Rhodes most beautiful beaches, pass through sleepy island villages and then stop in Lindos, Rhodes famous ancient village. Stroll down the Street of the Knights, admiring its medieval buildings with their impressive facades, and stop for photos by the Palace of the Grand Master of the Knights of Rhodes. Enjoy some free time to explore on your own  perhaps visiting the palace and its museum at your own expense  and then meet your guide to travel back to your ship. 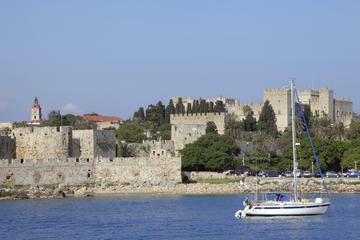 Your day trip finishes with a drop-off at the Port of Rhodes.